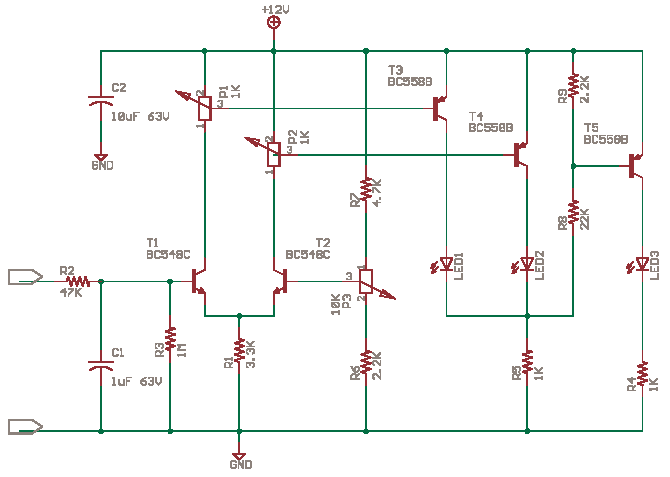 Voltage multipliers are used to obtain low current high voltage, from an existing AC Source. Step up transformers can be used, but the insulation problems and care that has to be taken for HV above 1kV, make it difficult. After SMPS technologies and Ferrites were developed, HV for CRTs was generated by blocking oscillators and step up Transformers at High Frequency AC. Use this with Low voltages like 24V AC for Learning. Do not Use it with High Voltage AC. If you are learning, first work with other circuits using batteries or Low Voltage Mains Adapters. This circuit uses Diodes and Capacitors, just like the text book circuits. This is a Constant Current Source LED Driver, When the LED driver Upper-NPN is driven by a voltage thru 4.7K the LED lights up. Assume that the Lower-NPN at bottom is absent. The current via LED and NPN is limited by R. 20mA may be ok 15mA even better. Or LED blows even transistor goes. BC547 is like 100mA-40V-200b, Limit collector current to 60mA, use it at less than 25V and depending on the individual transistor you may get a DC current amplification of 200 times. That is 1uA of base-emitter current could give a whooping 200uA of collector-emitter current. Still Thinking we do not have the Lower-NPN we calculate the resistor. Vcc – ( 2 LEDs * 1.7) – Vce = Vr that is the voltage across the resistor. You know ohms law and the current needs to be 15mA for a bright and long lasting LED. Lastly 1.7 the forward drop of a green LED and 0.6 a saturated or Turrned-On NPN Vce. Now you use the Lower-NPN, The above calculations do not hold anymore. Let us think a small current is flowing in the LED. Then the voltage across R is less than 0.7V, that means base-emitter diode of the Lower-NPN will not get to conduct. The Collector does not draw any current away. Now think that more current flows in LED, the voltage across R builds up above 0.7V the Lower-NPN is biased. The collector of Lower-NPN starts drinking current from the base of the Upper-NPN. So The Upper-NPN starts losing its bias. 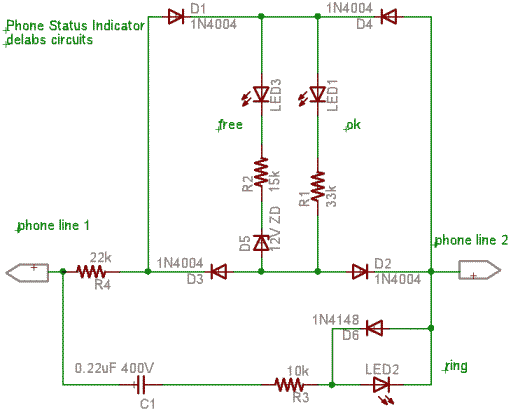 This lowers the LED current and contains, regulates or controls the LED current as shown in the formula. This will monitor telephone status without loading the telephone line, this way if you have two phones in parallel you will know if one of them is busy. Connect the two ends of circuit in parallel to phone lines. D1 to D4 make a bridge so that LED’s are powered in correct polarity. LED1 indicates line ok no broken line, LED3 can light only when a 12V Zener breaksdown, this shows if line is busy or free, so that you dont go online when someone is talking on the phone in another room. LED2 lights on an incoming call ringing signal. This is a higher voltage at least in older exchanges, so the cap protects the LED, and LED Lights when a AC ringing signal occurs. D6 protects LED2 from reverse polarity. Science is best learnt with practical lab work in tandem with theory. Theory becomes appetizing only with practical experiments. In fact theory should follow practical experiments. 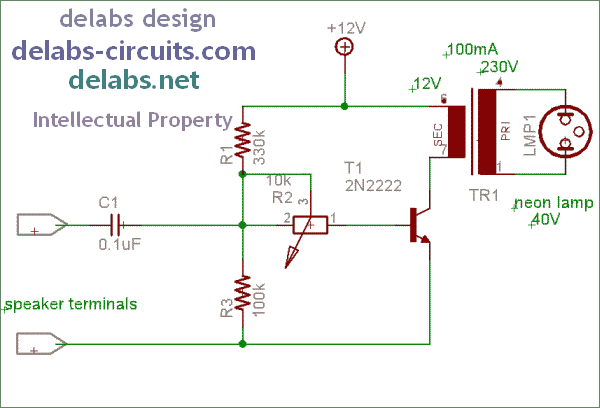 This circuit is a standard way of driving Small Power Relays from Control Signals generated by Logic or Opamp Circuits. C2 and R5 form a snubber which improves the life of the metal contacts, the contacts can erode due to sparking when switching inductive or even big loads. reduces EMI_RFI. The Electromagnetic Solenoid Coil is rated by Volts and Ohms. If you choose 12V ensure a stable 12V is provided, more voltage will heat coil, less voltage will cause sparking or will drop out the magnetic holding. A high coil resistance is better as the heat will be less and power consumption of your design is low. Q2 is any 500mA-50V-NPN device. 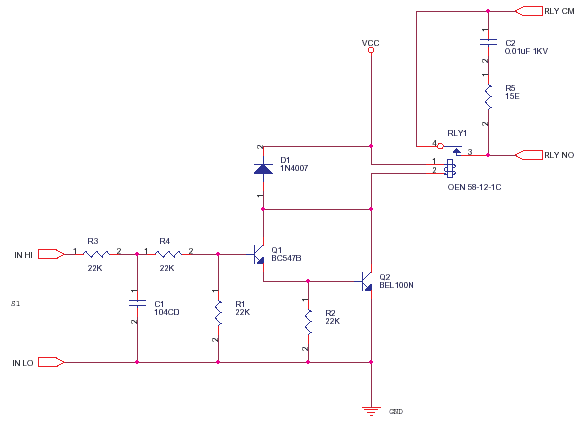 For a relay drawing 100mA-12V use a 200mA-50V device or better. D1 is a freewheeling diode, inductive kickback diode or snubber or something that stops the coil from zapping the Q2. Q1 and Q2 form a Darlington pair to amplify the low current drive of some CMOS gates. R2 and R1 is to hold the bases to ground and avoid floating or else they will pick up noise and relay will chatter….. the contacts will spark ……. the motor or heater will fail to work well……… and your product will get rejected ……….. the payments will be held up …… the customer may even ……………………… stop that right now ! R3 and C1 is a dampener for the signal so that quick relay operations can be avoided, this is important if your relay is driving a three phase contactor which runs a huge Motor. C1 can be increased if required. When huge loads are switched on-off in a factory, lots of spikes and drop outs will reset timer and logic circuits, this will turn on off above relay … leading to the load switched by this circuit going on-off. This may even lead to a Oscillation with the spikes as feedback which can cause great trouble during the troubleshooting process. R4 limits current. Neon Light Flasher was made by me when i was young, it was even published in a magazine, i think it will work, it was used on a very old huge ornamental valve philips stereo system in the remote speakers. Recently i captured this circuit in eagle to publish online, it seems to have a small design error. It worked well for many years. The step-down transformer is used as a step-up here. The secondary winding was around 50mA so the resistance was protecting the 2N2222. (SL100 was used in the original one). C1 and R3 may need tweaking to get the desired adjustment range in R2. The voltage across the speaker is fed to C1-Gnd, which blocks DC component. R1, R2, R3 form a threshold bias for T1. 2N2222 chops the 12V DC in tune with the music. The chopped DC current flowing in the 12V winding of TR1 is stepped up into AC pulses over 100V, this lights the Neon in flashes synchronizing in real-time with the beats. Known Issues – It does not perform well at low Bass like 20Hz. Volume control circuit for speaker 4 ohm or 8 ohm located in the another room far away. 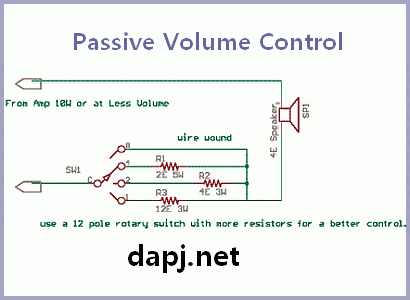 by using only passive components. This gives limited control and helps reduce volume when a conversation starts. The resistors are very low value. A simple circuit you can build at home at low cost it uses just a rotary switch and wire wound resistors. Add more resistors and a rotary switch with more contacts for finer control. An easy project to start DIY electronics is the Guitar Speaker. Make a good Acoustically friendly Wooden Box. Add a 20 Watt Audio Amplifier and a Large Speaker, There is a Power Supply too in this box. If you hear a Large Hum over the Strumming of the Guitar. You are in Business. You should know that this is a limited design, it is used when the speaker is far away from audio amplifier. In the early days audio amps were made of power transistors and signal transistors. (they came after valves), No remote controls, Radio tuners, Spool Players and Turntables would be connected to these via a Preamplifier and Rotary Switches. The Speakers in large wooden boxes would be kept at the far corners of the Hall, you could have a passive volume control in this with a Neon flickering indication of audio. That circuit is here Music Sound to light converter. This circuit is derived from a Siemens Application Note 1974. This circuit uses common components of today. The circuit is here as it is of high educational value. I have not tested it. 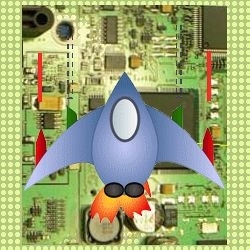 You can ‘simulate and test’ or ‘wire it up and try’ and let me know how it worked. The Circuit is also a simple analog to digital converter. You can use optos in place of LEDs. T1 and T2 make a differential amplifier. T3, T4 and T5 driving the LEDs are comparators. When input voltage is increased T1 is turned on which leads to more base current for T3 which Lights LED1. When input voltage is less T2 turns on as it gets a better base current from P3 which turns on LED2 via T4. When both LEDs are off T5 gets biased as no drop across R5 which lights the LED3 thru T5 hopefully. Beta is different in each transistor you buy and varies with the test conditions and even with temperature and age. The LED1 and LED2 will indicate above or below Limits set by P2 and P1. The Limit Threshold itself is set at P3 i think. LED3 will light when Hi LED and Lo LED both are off. The applications of this circuit are FM tuning indicator, Stereo Balance Indicator (Wire T2 like T1 then we get two channel inputs) and battery level indicator.